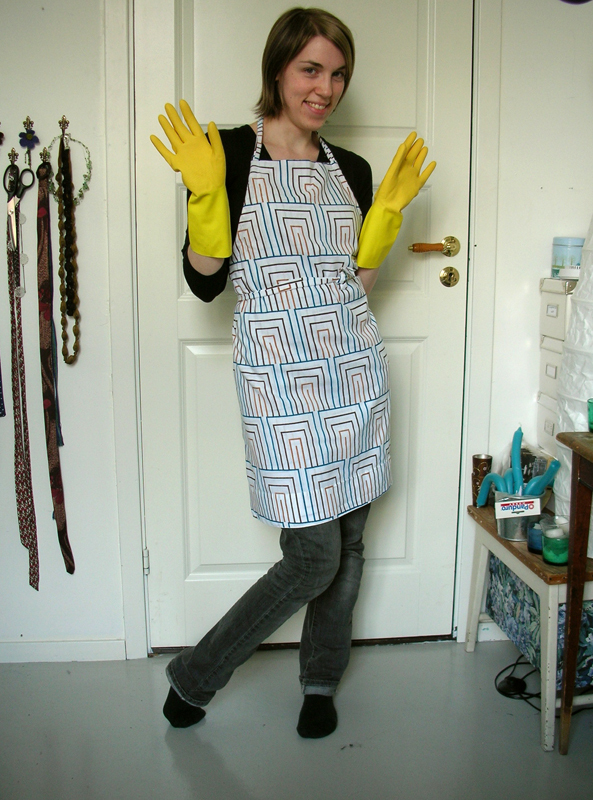 There is something about aprons that just invites you to roll up your sleeves, and make. 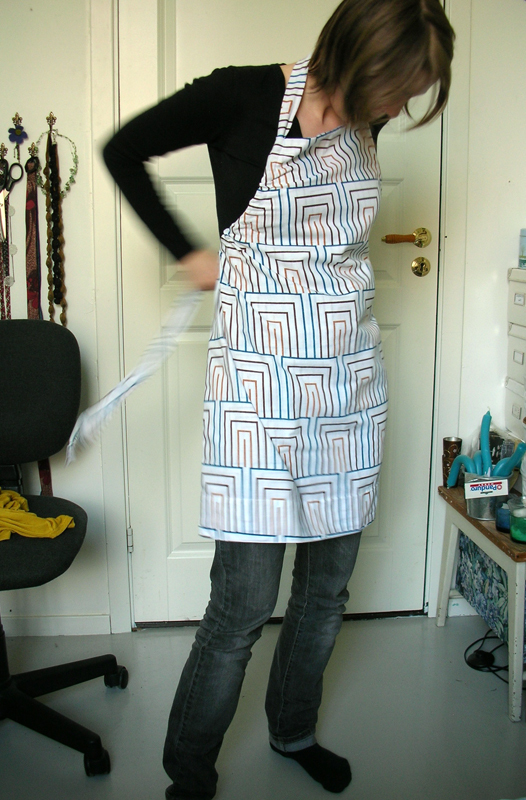 In grade school we would wear our aprons made in home ec class, while making food in home ec. At home the aprons would come on when we made plastic-clay room interiors on ice cream carton lids with dad, and with mom when we felted wool hats or helped her cook and bake. The fabric is a thrifted, thin curtain in a cotton-mix, so I used two layers of fabric. The sides were then sewed up, leaving strategic gaps for the band. 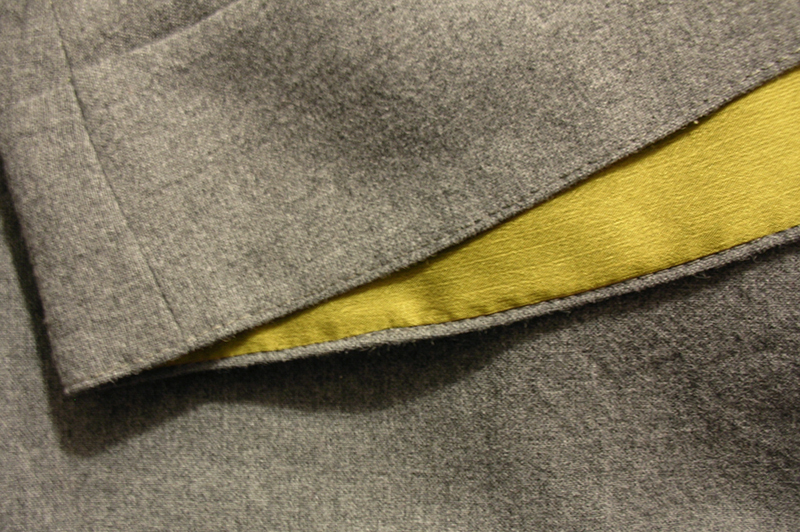 On the upper sides I added a seam to make channels for the band to go through, so it’s adjustable at the neckline. This was sent in a bright blue package to Berlin, where I hope it will lead an exciting life with my friend and her flatmates! I don’t have a finished project to show, but there is some craftiness going around! 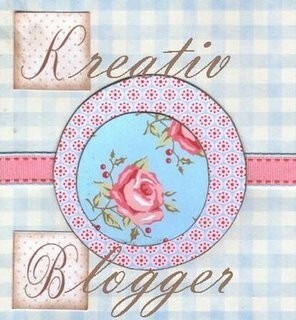 First up – I’ve been given a creative blogging award! The award-ee is Elisabeth over at petchypop. She’s lovely and crafty, and whenever we hang out (or live together) there is just lots and lots of making going on. Also, it’s not always you’re around people who appreciate and get excited about half-knitted socks and paper scraps and glue and vintage sewing machines (or just plain vintage). Elisabeth does. So thank you ms. petch! I’d like to pass this on to Tina. 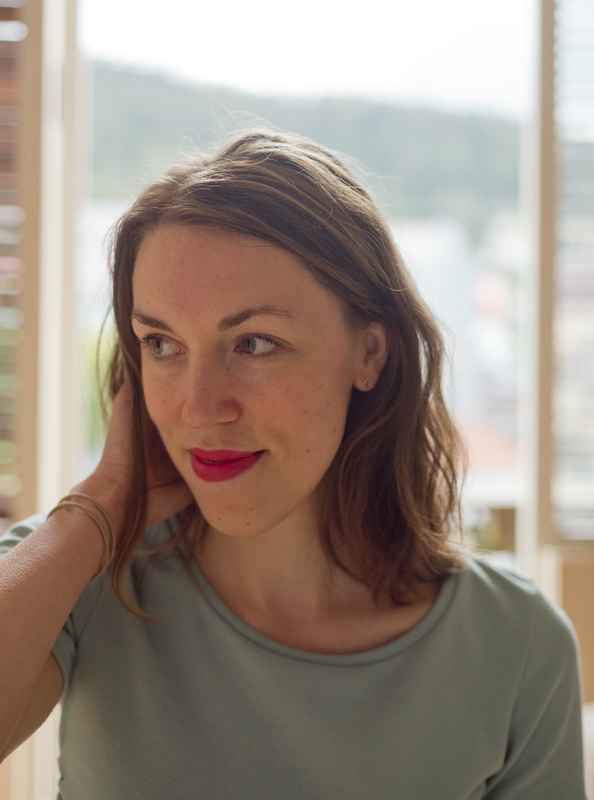 While I think this little award has been focusing on blogs about crafts, Tina works with words, and she does it wonderfully (and far beyond little alliterations!). Also, I am impressed with her front page with tiles, and clickables, and pictures and things that change when you hover over them. I have started a project – I cut out the first pieces of a dress today, and that’s always exciting. I’ve made a couple of mock-ups of the bodice, as I am copying this dress from an image in a magazine and essentially don’t have a pattern. So, I make it! I haven’t done proper pattern drafting in several years, so I’m anxious and excited to see if this will all work out. And, I’m willing to set my seam-ripper to work. That’s always a good start. To the left, late night sewing on the mock-up, and the to the right, the fabric. It’s a lovely green, sleek… cotton-mix. I think. 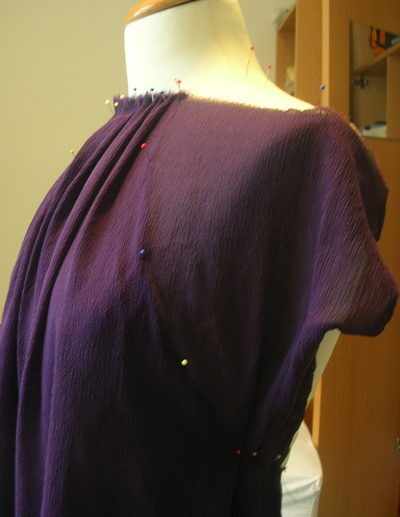 I’m using two layers for fullness and volume, so the dress doesn’t get too slinky. Oh, and happy birthday mom. She is my craft-mentor. The quality of her work, whatever the technique and however few times she’s done it before, is outstanding. I attribute my appreciation of anything beautifully made and finished to her. And she’s teaching me to spin yarn this summer. I sometimes forget that “making things” does not exclusivly equal to “sewing things”. I’m constantly working on a project, but when my knit projects are done, it doesn’t strike my mind to photograph them and post about it. Maybe this is because most of what I knit is smallish, utilitarian things; scarves, hats, mittens, more hats, more mittens… There is plenty to post about, just lying in my drawers! Some of the stuff I knit end up in other peoples drawers though (there really is a limit to how many handknit mittens I need), like the drawers of my boy. I’m sure he’ll be packing them away now with the summer almost here, but he kindly took some pictures so I can do a little show and tell. It’s like a boy-knit-themed-post! 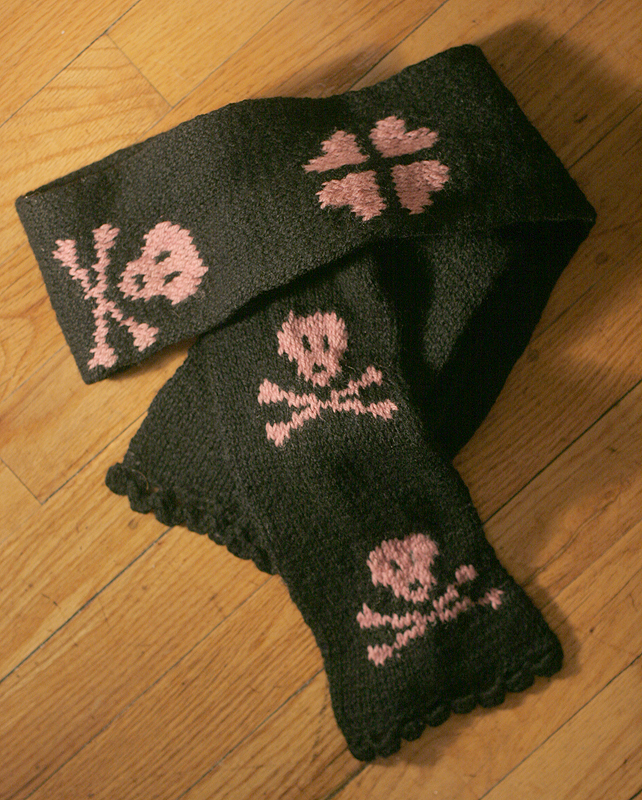 He had mentioned over the summer how fun it would be to have a skull scarf in pink, just for the oddness of pairing skulls with the color pink. This was his Chirstmasgift. The mom approved of my handiwork (which I appreciate since she’s a knitter too), but I do believe some of his family members found it “morbid”. 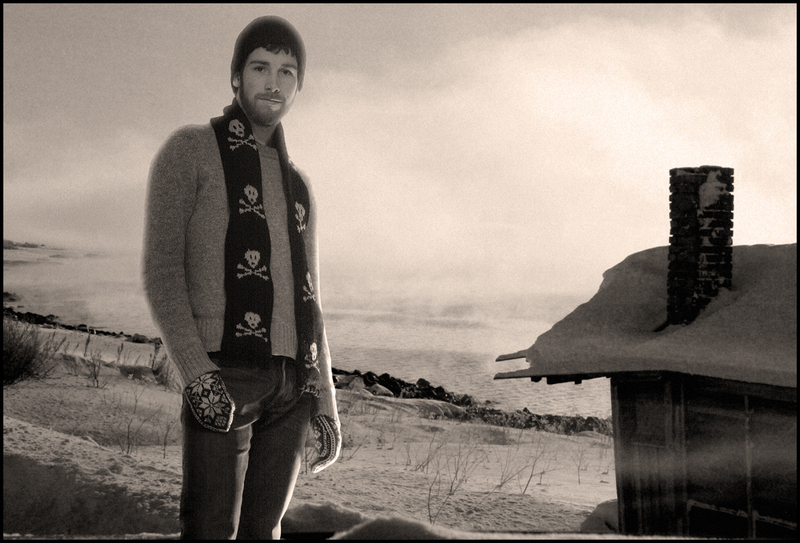 The scarf has gotten much use, happily, and apparently the solid black flip-side of the scarf comes in handy for situations where people might not look so kindly on random pink skulls. The boy picked out the colors, and I was testing the fit as I was making them, so it was hardly a surprise for him on Christmas Eve. They weren’t actually done by Christmas Eve, so if I remember correctly he unwrapped a sock and a half. Haha! 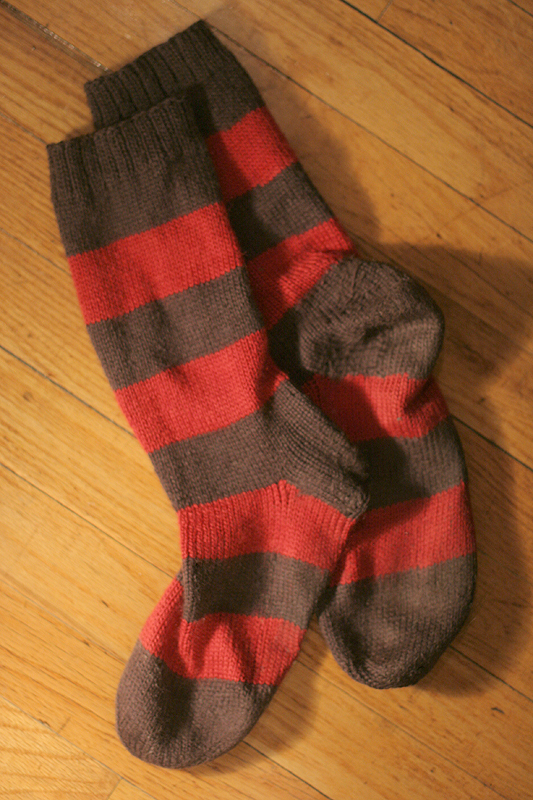 The yarn is a 80% wool, 20 % nylon mix, which is good for socks so the heel doesn’t wear thin too easily. Also, the yarn is fairly thin (26 sitches to 10 cm I think? ), so the socks aren’t too bulky – something I really like. Hmm.. maybe bulky socks should be the next project? And this past Christmas (can you spot a pattern? ), mittens! 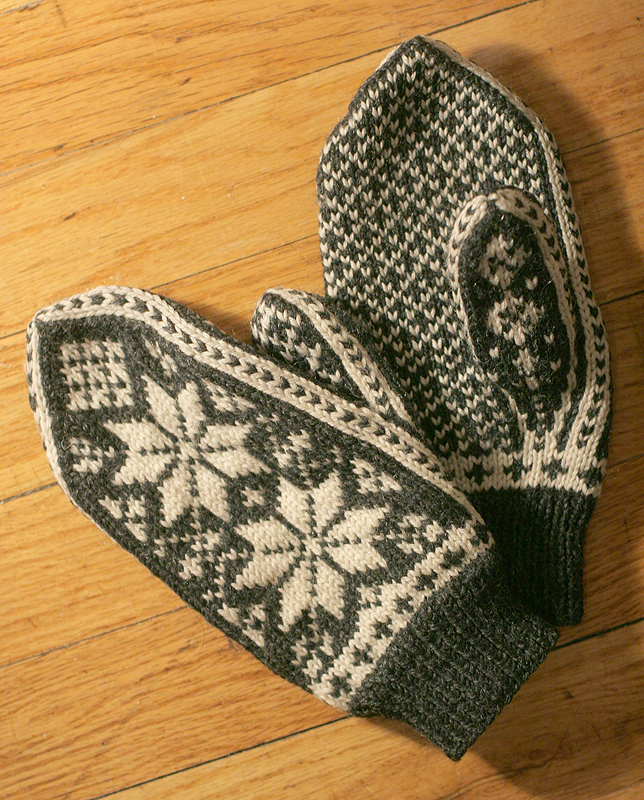 This is based on traditional norwegian knit-patterns. It’s my first time working in the round with two colors making pattern, and I’m quite happy with the result! This was also my first time making thumbs the proper way, with adding on stitches leading up to the thumb. It makes for a better fit than the simpler way I’ve been making thumbs, just casting off some rows at the appropriate place, and making a gap that I later pick up again. 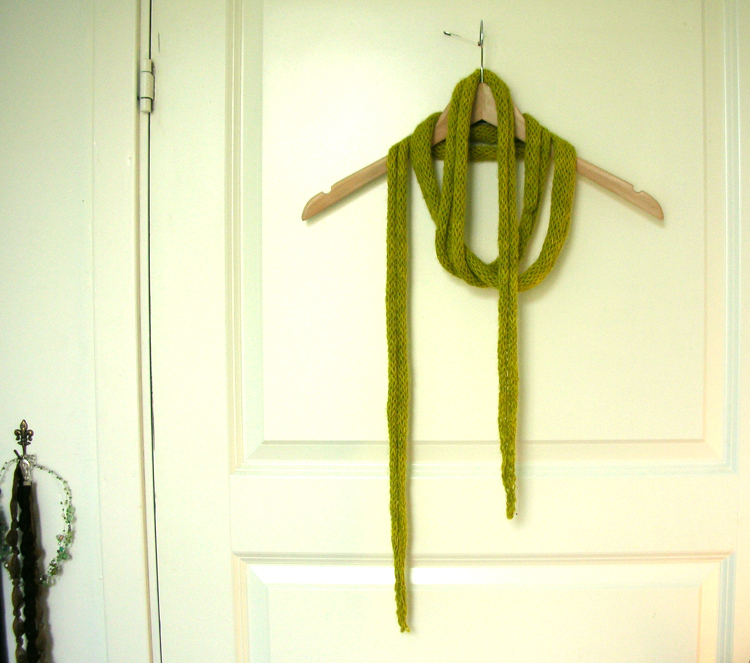 These are made of 100 % wool yarn, and since there is effectivly two layers of yarn, they are pretty dense and warm. The boy was very satisfied too, and they’ve gotten lots of use this past winter – and nothing is better than that! 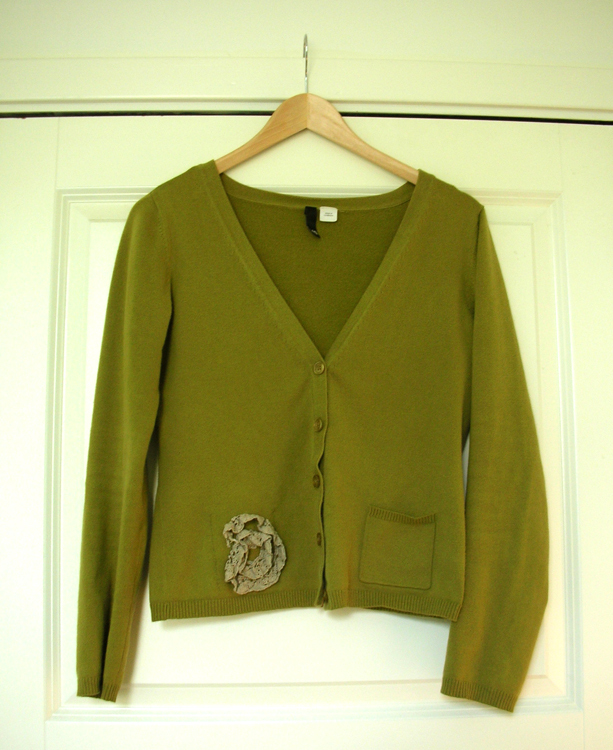 From the left: a cardigan my sweet friend kindly gave me during a wardrobe purge I helped her with (eh, supervised…). I tried taking off a pocket, but that failed, so I added som linen lace to cover it up. 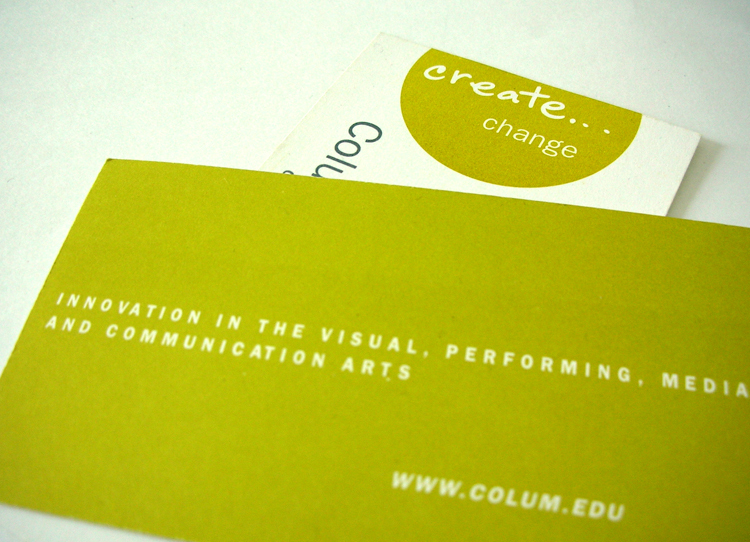 ♦ businesscards from the school I’m attending come the fall. 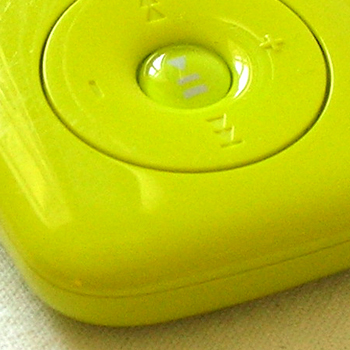 They had me at “hello (this is my businesscard)” ♦ my mp3 player. The salesguy said he’d been waiting for someone to buy it in this color. 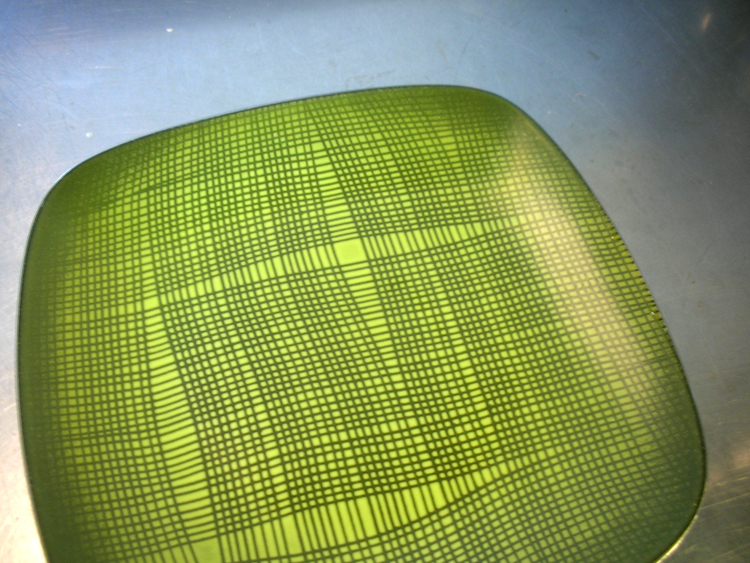 ♦ possibly the first thing I made in this undefinable color between green and yellow. It’s made from one skein of alpacca wool, knitted on huge wodden size 10 needles. ♦ these pillows used to have red pillowcovers, and they matched a thrifted armchair I have. Now they match all the turquoise stuff I own.♦ I so wish this enameled plate was mine, but it belongs to my flatmate, who inherited it from her greatgrandmother or something. I’m so envious. 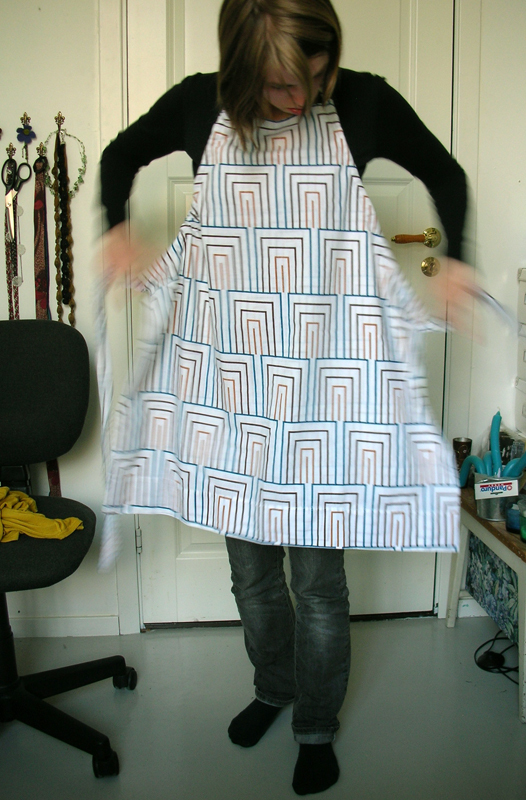 My dear friend Stine stopped by on her way to a dance gig in Istanbul, and willingly modeled a dress I made her a year ago. She was told to bring fancy clothes for a party after the gig, and she brought my dress – I’m flattered (and proud)! This is the second dress I’ve made for her, and she likes to say she has a designer making her clothes. Who am I to argue with that – she’s my # 1 client! I was aiming for more classy than sleazy, and with all that skin revealed, the only thing that made sense was to keep the dress itself quite loose and flowing, and not skin-tight. Both the back and the front have deep pleats. The fabric is a gorgeous, crinkly silk chiffon I bought in Paris. I figured the dress would require less ironing, since the texture of the fabric itself would hide some crinkles. Sometimes, just sometimes, you whip up a skirt, from drafting the pattern, cutting it out and sewing it up, all in one day. I was ecstatic to discover, on such a day, that of my many sewing feet, one of them was a hidden zipper foot. I was not so extatic to discover that the seam initially came too close to the zipper to be functional. That resulted in a less than fortunate incident where the zipper busted, and I was stuck in a highwaisted, snug-fitting skirt. 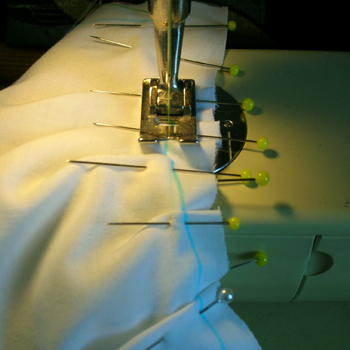 I ended up putting my seam ripper to work on one side seam, and wriggeling out of the skirt. Luckily I wasn’t running late for anything. I’ve since fixed the sideseam and made another (forth and fifth) attempt at the seam, and it’s all done! 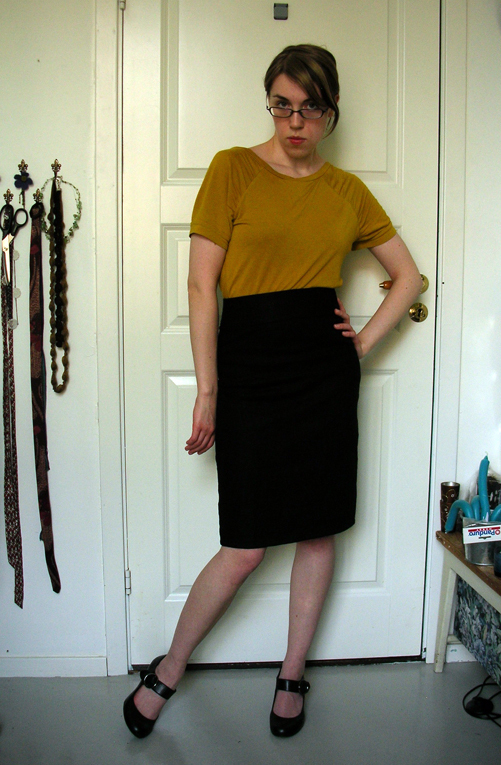 Some silly posings: Scarlett Johansson-style (pigeon-toed), pouty secretary-style, cell phone-style (writing silly faux french text messages), 40s-style (flabbergasted housewife). The fabric is a medium heavy linen, quite textured. I’ve used it before for a pair of dress pants. This time around I managed to get the stretch to go the right way (across, not lengthwise!). I’ve finished my green and grey dress! All ready for spring with a new dress! 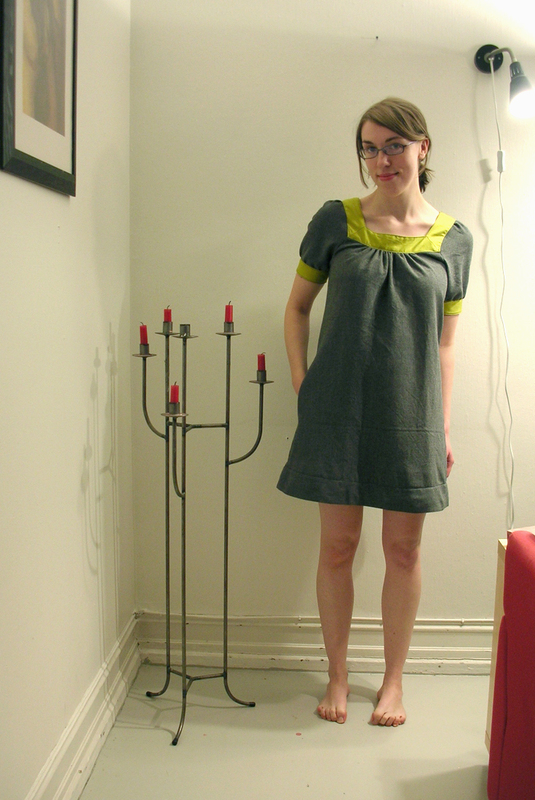 The pattern is kind of based on Simplicity # 4589 and Built by Wendy (or is it Built by You?) # 3835, and full of my own alterations. I lengthened the top from the Simplicity pattern, and based the lengthening of the sleeves on the Built by Wendy pattern. One problem with insisting on the “wing it – try it on – unpick seams – try again”-approach to sewing is that sometimes it turns out that it’s ok to heed the patternsizes, and that sometimes interfacing is your friend. That aside, I’m quite happy with my dress! 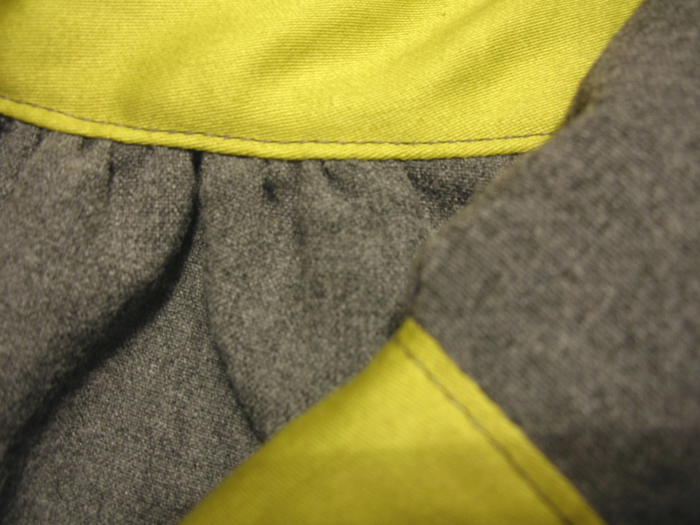 And see the inseam pocket? Inseam pockets are the best. 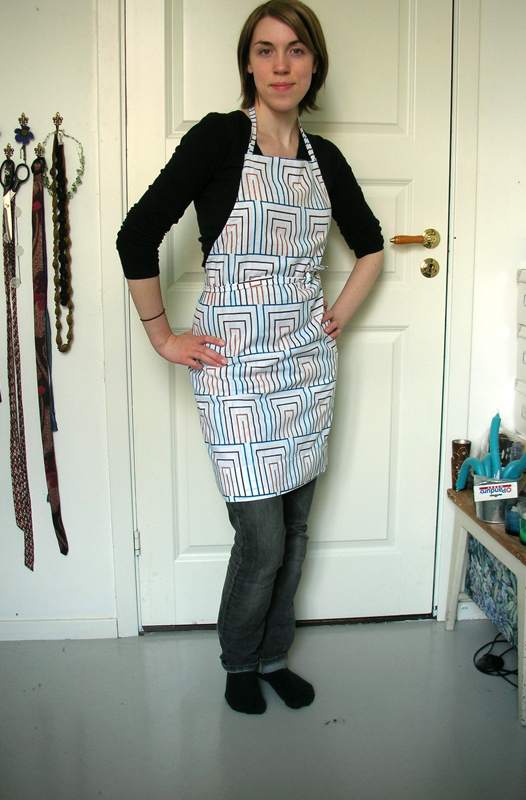 The dress was a bit of a patchwork to make, since the pieces I had weren’t all that big. 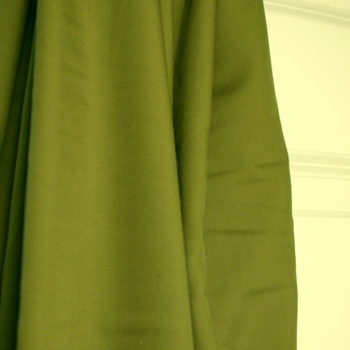 Hence the added panel at the bottom hem, and the diagonal seams on the yoke… The green bits were taken from a dress I thrifted some years back, and I just adore the color (which might be appearent from the header-image!). So far I’ve used that dress for three different projects, but there isn’t much more left of it at this point. The grey fabric came from a friends grandmothers apartment, where I was helping to downsize. In the process I scored some nifty stuff; knitting needles, knitting pattern, fantastic vintage postcards, some belts and this piece of grey material. I’m really not sure what it is though, I’m thinking a viscose blend, based on the feel of it. It’s kind of heavy, but still has a very nice drape. I can’t even start to say how much I love this greenish, yellowish color. It’s such a perfect blend of bright, muddy and acidic! 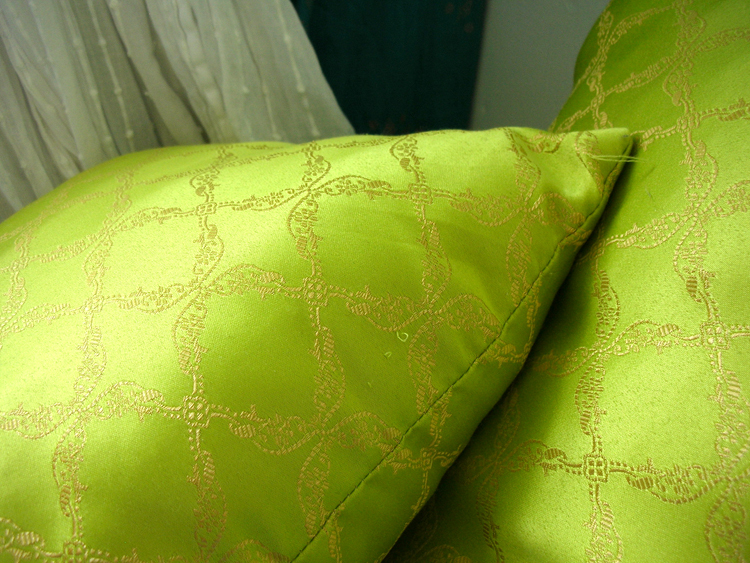 I’m not sure how to refer to the color though – is it yellow-green, green-yellow, lime, chartreuse? In any case, I think it’s the perfect color to lure spring out of it’s hiding with!